Climate scientists tell us we face a “climate crisis”: Since the 1990s, scientists have been trying to convince governments to keep atmospheric CO2 concentrations below 350 ppm in order to keep the global temperature below 1.5 degrees Centigrade above pre-industrial levels. They’ve failed. In 2013, CO2 concentrations surged past 400 ppm, last month topping 410 ppm and climbing fast. Temperatures are soaring around the world, to 1° C above pre-industrial levels. If we don’t radically and quickly suppress emissions, temperatures could soar to 4°- 6° C above pre-industrial levels by the close of this century, which would mean the end, the collapse of civilization. So far, with temperatures up just 1° C from the nineteenth century, just look: Melting is accelerating from the Arctic and Greenland to the Antarctic, the world’s glaciers are shrinking, sea levels are rising enough to force people to pull back from shorelines, an invading sea is already infiltrating Miami’s drinking-water sources, the American Southwest is facing near-permanent drought, the U.S. West now has a nearly 12-month fire “season,” and conifer forests are dying from southern beetle infestations. In parts of Africa and India, it’s become too hot to farm. Tibetan glaciers are melting, with huge implications for billions of people from China to India. Recently, as temperatures hit 117° F in Pakistan, people were collapsing, even dying in the streets. Yet governments do nothing. The irony is that we all know what we have to do. It’s completely obvious. We need to radically suppress greenhouse gas emissions and production of fossil fuels and to stop deforestation, overfishing, and pillaging the planet to make products we don’t need. And we need to stop dumping all manner of pollution and toxics everywhere. None of these problems requires any big technological breakthroughs; mostly we just have to stop doing what we’re doing. The problem is we can’t seem to stop, or even slow down. While global warming will kill us in the long run, stopping overconsumption would kill us in the short run because it would precipitate economic collapse, mass unemployment, and starvation. This is the ultimate fatal choice of capitalism: We have to destroy our children’s tomorrow to hang on to our jobs today. To date, all market-based efforts to stop temperature rise, such as carbon taxes and cap-and-trade programs, have conspicuously failed because they’re all subordinated to maximizing growth. Plus, they don’t even address the other huge environmental crises we face: plasticization of oceans, deforestation, coral reef collapse, species extinction, the trash crisis. There’s no “green capitalist” solution to our climate crisis or to any of these other related crises and problems. In my “Six Theses on Saving the Planet” paper for the Next System Project (November 3, 2016), and in my book Green Capitalism: The God that Failed (World Economics Association Books, 2015), I said that it’s too late for half-measures. The only way to meet the climate emergency is with an emergency industrial shutdown in the overproducing and overconsuming countries of the North including China: Park the cars, ground the aircraft, stop shipping slave-labor-produced goods from China. Stop building McMansions, stop producing SUVs, stop producing throw-away products, plastic junk, designed-in obsolescence products from plastic shoes to iPhones and IKEA furniture. Stop inventing stuff we don’t need just to maximize profit. Capitalism is overwhelmingly the main driver of planetary collapse and cannot be reformed enough to save humanity. Solutions are blindingly obvious and ready at hand, but we can’t take the obvious steps because, given capitalism, the first result would be economic collapse. Democracy requires rough socio-economic equality. Mainstream environmentalists have focused largely on pushing a tech solution to our climate crisis, especially by replacing fossil fuels with solar and wind energy and replacing gasoline-powered cars with electric cars. Thus in 2016 Bill McKibben and e-tech darling Elon Musk called for a “revolt against fossil fuels.” That year, McKibben published a widely read article in The New Republic calling for a “World War II-style mobilization” to replace our hundreds of millions of fossil-fuel-powered cars with hundreds of millions of solar- or wind-powered electric cars.1 McKibben says nothing at all about suppressing production and consumption of anything else except fossil fuels. Thus the implication is that people can say, “Oh I can just buy a Tesla, help save the world, and carry on with my lifestyle more or less as usual.” Saving the world becomes all but painless (save for the sticker shock on the Tesla). No wonder mainstream environmentalists are gaga over Elon Musk. He doesn’t ask us to sacrifice anything. Just buy his cool “green” product and save the world in the bargain. Note further that the UCS life-cycle study did not take into account battery replacement. The Tesla Model S’s battery is currently warranted for eight years or 125,000 miles. The retail price for a new battery is $44,000, about half the price of the car, according to the Forums page of the Tesla website. My guess is that given the cost of the battery, even if that drops over time, most Tesla drivers will junk the car and buy a new car in eight or ten years, especially given that although the “New Improved 2026 Model” will surely get more miles per charge, just as surely those new batteries won’t fit in your 2018 “old beater,” so you’ll have to sell or junk it. But who is going to buy a ten-year-old secondhand Tesla that needs a $44,000 battery? Not me. If there’s no secondhand market for Teslas, they’ll end up being crushed even faster than regular gasoline-powered cars, meaning their net emissions and waste will be that much greater than, say, my Volvo, if it ever dies.7 If this is the case, we’re still looking at something like an average eight- to ten-year lifespan for Teslas, the same life-expectancy of most gasoline-powered cars today (though those older Volvos commonly go 300,000 miles or more on un-rebuilt motors, while VW Beetles have a virtually endless lifespan). Here is my vote for the World’s Most Ecological Car: a 1953 or thereabouts Chevrolet being driven around Havana. Nineteen fifty-three Chevrolets got around 13 miles per gallon, about the same as the current 2018 Chevy Impala (rated at 14 mpg city driving).8 But the mileage is not the most important point. The most important point is that this car has a much smaller carbon footprint than any Tesla or Prius or Volt out there, not because it gets great mileage, but because people have been driving it for 65 years. Since the U.S. imposed its blockade on Cuba in 1962, we Norte Americanos have each gone through an average of six to eight cars—with all the pollution associated with their production and disposal, while the Cubans have thriftily and ecologically repaired that old Chevy and kept it on the road (not their own choice to be sure, but nonetheless). The point is that it’s not what’s under the hood that’s important. What’s important is the whole capitalist automobile industry business plan that is based on designed-in obsolescence to needlessly destroy the planet by needlessly convincing you that you “need” to junk your old car and buy that new car every few years. Like iPhones. Same system, same logic. That’s the real problem. When we talk about “ecological rationality,” we have to consider this from the standpoint of the whole economy, the whole society, the whole planet, not just from the standpoint of which motor is under the hood. That’s what McKibben and tech-fetishist environmentalists don’t get. Of course, the best option is to do away with cars as much as possible. Expand public transit. Get out of our cars and onto our bicycles, or walk. But to the extent we do need cars, we need to build them to be small energy-sippers, not humongous and extravagantly wasteful 5,000- to 7,000-pound resource hogs. We need to make them rebuildable, upgradable, and recyclable instead of disposable—and make them shareable. That would be true sustainability. Labor union calls for “a million green jobs” sound great.9 And they are great if those jobs are building renewable-energy capacity, retrofitting homes and buildings to improve energy efficiency, building public transit, and similar projects. There is much low-carbon work to be done: environmental remediation and upgrading our schools, our health care system, and our public infrastructure, and so on. But we can’t be for growth for growth’s sake, even green growth, and unsurprisingly, most union-backed green-growth programs fail to challenge the growth mantra. But if we build renewable energy utilities only to use the power to produce cars we shouldn’t build, wasteful luxury housing that should not be constructed, pointless new gadgets and disposable products of every sort—all the needless waste we produce now, it will all be for naught and we’ll still be on the road to collective ecological suicide. Rick Wolf and Gar Alperovitz call for worker ownership as the way forward. Worker ownership is great: It can provide better security for workers, it promotes collective work and sharing, and so on. But this model doesn’t challenge growth or the market system. The limitations of the worker-owned company model come into sharp relief when we consider the massive changes needed to suppress capitalist overproduction and create a truly sustainable economy. Suppose, for example, that Peabody Coal and ExxonMobil and Chevron were actually worker owned. Well, what happens when we have to shut them down to save the planet? If we’re going to “leave it in the ground” to save the climate, that means we have to shut down oil and coal companies. Or how about United Airlines or Avis Car Rental, both of which used be worker-owned companies, but both of which would almost certainly have to be drastically retrenched or even closed down to save the planet? The solution is not worker ownership of individual companies competing in a market economy, but public ownership and planning of most of the economy. To save the planet we need to completely reorganize and reprioritize the entire economy: Many fossil fuel producers and fossil fuel-dependent companies will have to be phased out, others reduced. New production facilities for renewable energy, organic farming, safer non-toxic chemicals, and others will have to be started up. At the same time, we need to create new jobs for all the workers in those industries we must eliminate to save the planet. No free market is going to do this. All these issues require rational planning, not market anarchy. Despite the hard work of so many well-meaning activists, I suggest that the divestment movement is a waste of time. It doesn’t challenge growth, doesn’t challenge current oil consumption, diverts the whole effort into managing stock portfolios, and is a distraction from the conversation we need to be having about suppressing fossil fuel production. No doubt many young people have been radicalized in divestment movements, which is great. But I bet they could have been even more radicalized if they’d been recruited to work in campaigns that actually try to suppress fossil fuel consumption on campus, in their communities, in commuting, in what they wear, what they eat, and so on, instead of focusing on stock portfolios. The de-growth people are right as far as they go, but, here again, they don’t challenge capitalism or the market. Besides, we don’t need to de-grow everything. In fact we need to increase production of some things—renewable energy, organic farming, schools, health care, social services, environmental restoration, bicycles, and so on—so we can’t leave this to the market. This requires rational planning. De-growth is promoted in part by people who want to live simpler lives but don’t see a way to challenge capitalism. It’s also become an academic cottage industry for professors and grad students who want to feel like they’re doing something but don’t want to criticize capitalism. Professors can talk and publish articles and books about de-growth all they want without threatening their promotion and tenure or amassing a radical-sounding publication record. Even some eco-socialists are too timid, to my mind. They talk in abstract about eco-socialism in the future, but are afraid to talk about nationalization, afraid to talk about planning, terrified of mentioning rationing. They’re afraid to say to workers, “Sorry, but to save the planet, your industry (oil, autos, H&M clothes, Ikea, for instance) has to go.” They’re afraid to say anything that smacks of “sacrifice”—because they’re socialists, they want more for workers not less. I myself was criticized at a public forum at Bard College in 2013 over just this issue. ISO eco-socialists attacked production but not (workers’) consumption. They rail against the “evil” oil companies, but don’t challenge oil consumers. I reminded them that oil companies don’t actually burn the oil and gas. WE burn the oil heating our homes, keeping the lights on, driving our cars, flying across the country, and so on. If we don’t talk about this, then we end up sugar-coating the deep changes we really need to make. In my view, and in the view of climate scientists, these activists are just not grasping the gravity of the emergency we face. At this point, we have no choice: We can’t suppress emissions by the 90 percent we need to, unless we shut down, or at least drastically retrench, whole slabs of industries from the U.S. to China—not just oil and coal, but also steel, aluminum, autos, airlines, shipping, construction, chemicals, plastics, electronics, apparel, furniture, tourism, all kinds of retail, banking, advertising, entertainment, and more. Without doubt, that is going to mean sacrifice and lost jobs across the economy. On the other hand, there are going to be no jobs on a dead planet, so we better figure out how to cashier those fossil fuel companies and create new jobs for those workers. There are not going to be enough green jobs to replace all these. We need to transition to an economy where we produce a lot less, where we minimize not maximize production, where we minimize not maximize work, where we don’t have to spend our lives working overtime to survive. have not been especially effective as a means of significantly reducing CO2 emissions, and they are not likely to become more effective over time. … Despite these substantial accomplishments, [I and co-author Tyler Hansen] nevertheless conclude … that most efforts now devoted to divestment campaigns would be better spent on more direct efforts to drive down fossil fuel consumption and CO2 emissions. We simply don’t have time to lose in pushing as effectively as possible on the fundamental goal which we cannot lose sight of—which is to drive CO2 and other greenhouse gas emissions down to zero as quickly as possible. Last year Americans set an all-time record for number of miles driven and gallons of gasoline consumed. The biggest selling “cars” in America aren’t even cars, they’re humongous gas-hog SUVs and ginormous trucks. Consumers just keep buying those beasts with nary a thought to the implications this has for their children’s world. During the OPEC gas crisis of the early 1970s, Americans switched from gas hogs to mini-car gas sippers practically overnight, saving billions of gallons of gasoline. Today, our environmental “leaders” don’t even suggest that, hey, we should do that again. People buy ever more disposable clothes at H&M, Zara, and elsewhere, with huge implications for the environment. People are still slaves to fashion, to consumerism. They still think they “must have” that latest (trivially different) iPhone 6, 8, X—and don’t all those Chinese workers need the jobs? People jet off on vacations to Florida or Mexico or Bali with nary a thought to global warming consequences of this. After decades of environmental activism in the U.S., where’s the environmental consciousness? It’s hardly surprising since environmentalists have rarely if ever talked about these issues. Huge billboards calling for “leaving the oil in the soil” have been put up by 350.org, but where are the billboards calling on people to stop burning that oil, stop driving humongous gas hogs, get out of their cars and ride a bike or take a train? Protestors by the thousands fought to stop a pipeline in North Dakota. But where are the protests at the headquarters of General Motors or Boeing or United Airlines—the biggest consumers of oil? Where are the mass protests against plastics? Where are the protests against gas-hog, planet-destroying SUVs? Environmentalists are afraid to challenge personal consumption or the priorities of capitalist production. Well, if they want to save the planet, they’d better start talking about these issues or there’s not going to be any planet left to save. We need to be saying, “This has to got to stop.” We can’t have an infinitely growing economy on a finite planet. We can’t go on like this, or we’ll go the way of the dodo. We need to call for nationalizing fossil fuel industries and those dependent upon fossil fuels. That’s the only way to shut them down. We need to campaign for renewable energy but call at the same time for limits on energy consumption: get rid of gadgets, air conditioning, overconsumption. We need to campaign against gas-hog SUVs and cars in general. We should burn a papier-mâché SUV in front of GM’s headquarters, or offer SUV drivers a bike in exchange for their car. That’s right. Too obvious. This is what we need to be saying. We need to be saying that “yes, your company, your job making disposable trash, all need to be abolished to save the planet.” Either we save your company and your job—for a while—or we save the planet. There’s no other choice. Thousands of companies from here to China have to be shut down to save the planet. There’s just no other choice. We need to call for rationing airplane flights, to ban excessive air travel, trivial package tours, or business flights. And of course, if we’re going to shut down industries then society has to provide other non-destructive jobs for those workers, guaranteed jobs—Just Transitions. None of this is going to happen in a capitalist economy. We would have to transition to some kind of eco-socialism to get rational planning or to provide new jobs. But to get there, we need to change the conversation, to get people to talk about and debate these urgent imperatives. We have to be telling people that the only solution is to cashier capitalism, transition to an eco-socialist planned economy, replace rationing by price with rationing by need. Replace market anarchy with rational planning, democracy, and equality. Of course we’ll be attacked and ridiculed: “Shut down industries, are you crazy? Rationing, what is this, Russia?” We should welcome their attacks. We want that global conversation. We invite the capitalists to attack us, because we can’t lose on the science—because their only “solution” is more of the same growth that’s driving us to collapse right now. There are no jobs on dead planet, and transitioning to some form of ecological-socialism is the only way to save ourselves, and the whales. Steve Hanley, “Musk, McKibben Call for Revolt Against Fossil Fuels,”Gas2, May 6, 2016. Bill McKibben, “World at War,” The New Republic, August 15, 2016. Umwelt-und Prognose-Institut Heidelberg, Oeko-bilanz eines autolebens (1993). See John Whitelegg, “Dirty from Cradle to Grave,” (World Carfree Network, 1993) for a translated summary of the German. Union of Concerned Scientists, Cleaner Cars from Cradle to Grave (Nov. 2015), 3. Geoffry Brooks, “The trouble with aluminum,” The Conversation, May 24, 2012. Lloyd Alter, “New Tesla Model X Is Too Heavy to Legally Drive over the Brooklyn Bridge,” Treehugger, Feb. 25, 2016. But here are some sources: Smith, Green Capitalism, 77ff., and sources cited therein. Also Kitco, Tech Metals Insider, Dec. 16, 2014 (accessed 8/27/18); EPA, Application of Life-Cycle Assessment to Nanoscale Technology: Lithium-ion Batteries for Electric Vehicles (Washington D.C.: U.S. Gov, April 24, 2013); Amy Westervelt, “Tesla’s new batteries may be harder on the environment than you think,” Guardian, June 10, 2015; Rafael Sagarnaga Lopes, “Bolivia’s lithium boom: Dream or nightmare?” Open Democracy, Dec. 21, 2015. I bought a used 2004 Volvo station wagon in 2012 for $10,000. Today, it’s 14 years old, has 100,000 miles on the clock, and still runs like new with just regular service. I’m not anticipating any major expenses on this legendary vehicle for the next 100,000 or even 200,000 miles. But if I had bought a secondhand Tesla in 2012, I would need to spend $44,000 for that new battery very soon if I had not done so already. Who would buy a used Tesla anticipating that kind of expense? E.g., Campaign Against Climate Change. 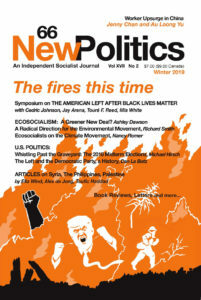 Richard Smith has published extensively on capitalism and the environment and on China’s ecological crisis in New Left Review, Monthly Review, Ecologist, Journal of Ecological Economics, Capitalism Nature Socialism, Real-World Economics Review, Truthout, Common Dreams, Adbusters, The Next System Project, and other media. 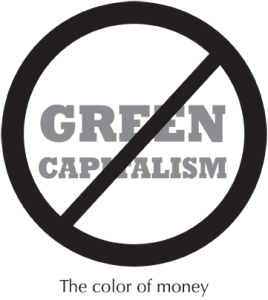 His book Green Capitalism: The God That Failed appeared in 2016 (World Economic Association Press). His China’s Engine of Ecological Apocalypse will be published in 2019 (Verso). Richard is also a founder of SystemChangeNotClimateChange.org. This article is based on a talk at the Left Forum Conference, June 3, 2018. 1 Pings/Trackbacks for "A Radical Direction for the Environmental Movement"